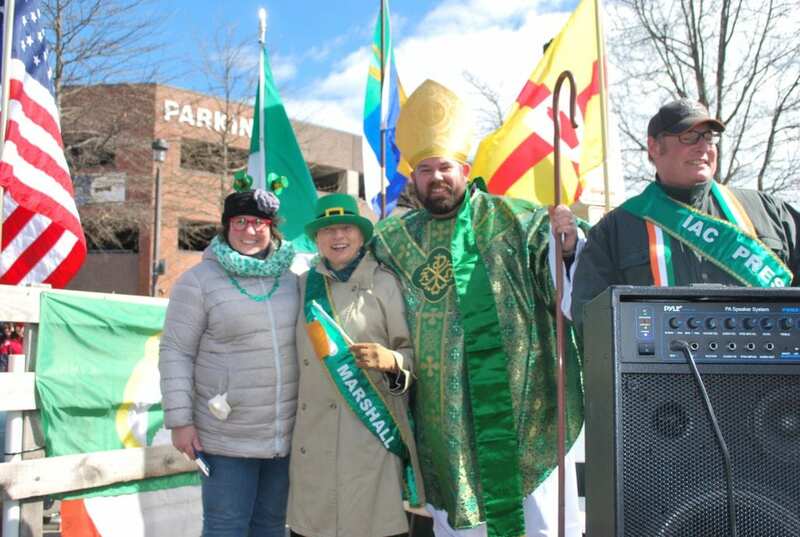 Irish American Club members and friends were out in force in St. Patrick’s month of March. Crowds of people packed Commercial Street in Portland Maine to witness the largest parade yet, presented by the Irish American Club and MC’ed by gifted local actors Tony Reilly, founder of AIRE Theatre and Paul Haley. The weather was kind, mid-thirties and sunny, encouraging spectators of all ages to show up wearing the green, white and orange of Ireland, to show their solidarity for their near and ancient ancestors. They were joined by none other than the Governor of Maine, Janet Mills, suitably decked out in ‘the green’, mixing and celebrating with the people to great effect. We are honored to have great support from our local first responders. Our parade is led by the color guard of the Portland Firefighters who have led the parade since its inception in 2006. Many dignitaries joined the Governor of Maine, Janet Mills and the Mayor of Portland, Ethan Strimling as well as elected officials from Augusta and Portland. We were also joined by the U.S. Coast Guard, U.S. Border Patrol and Maine Maritime/Navy ROTC. Thanks for the support. The crowd especially enjoyed the sporting exhibitions of the Maine Gaelic Sports Alliance and the Portland Hurling Club, who incidentally won the prize for ‘Best Float in the Parade’. It was a movable Gaelic Football/Hurling/Camogie goal posts into which young players practiced their skills all the way along the route. For the second year in a row we have been delighted to include the ‘Portland Women’s Rugby Club’. These ladies impressed with exhibitions of their talents. Portland is very lucky to field teams in Rugby, Hurling, Gaelic Football and other Gaelic games. Let’s get out and support them! No parade in Portland would ever be complete without the participation of The Claddagh Mhor Pipe Band, a group of accomplished musicians under the direction of Tom Ryan, who have proven their virtuosity by playing by invitation in Ireland, Scotland and many other venues. The fabulous skills of the ‘Stillson School of Irish Dance’ is of course renowned worldwide for their talent, flair and generosity. Carlene Stillson and her group of dancers, (and roadies!) never fail to support the Irish American Club in all its endeavors. Long may they celebrate the culture and impress their fans and audiences. A bonus this year was the unexpected visit of Saint Patrick himself! He appeared, from out of nowhere and proudly marched with the Ancient Order of Hibernians, – only fitting I suppose, followed by a promotion for inflatable Pubs. No surprise, I’m sure he visited an un-inflated ‘shebeen’ in his time. He may well have been surprised to see the Star Wars characters of Wampa Clan that have become a staple of our parade, but he would have been well acquainted with the ‘Ghostbusters’, although they would have been sporting less fire power in his time! His crozier would have been enough! Regular entry Joe Carro and his Cosplay Custom Superheroes and film characters were as usual a big attraction. Much loved entrants this year were the cutest ponies and goats nurtured and shepherded by Camp Ketcha. A children’s favorite. Also, the aptly named St. Patrick’s Racing Stable of Oliver and Melissa Keithley presented one of their retired beautiful race horses. A great entrant for the horse lovers of Ireland. The spectacle of forty, yes forty flags representing the 32 counties and the four provinces of Ireland, not to mention a four flag color guard which included the provinces, the Irish and of course the American flags, had Commercial Street awash in color. This is a presentation seldom anywhere in the world! Well done IAC! Over forty individual groups took part in the parade this year, including Mercy Hospital, St. Brigid’s School, Girl Scouts of Maine, Maine Irish Heritage Center, Burns Ceili Group, and of course the large delegation from the local Unions, who support the parade with time, talent and treasure. Thank you. Rí Rá Irish Pub & Restaurant and Bull Feeney’s. both these establishments provide space and financial help to promote the Parade and Irish Ceili Dancing also presented by The Irish American Club of Maine. Mascots abound at the Parade, including many from our local sports teams. Slugger (baseball) is ever present. This year we saw Beacon (Maine Mariners Hockey). Crusher was a no show this year, maybe an over energetic fisherman reeled him in! Ernie the CPort Starfish (Cport credit union) and Oakie the Acorn (Oakhurst Dairy) were joined by a HUGE glass of Guinness from Nappi Distributors. As always our safety and coordination are ensured and supported by the Portland Police, Fire Dept. and emergency services. We appreciate all their hard work and support. Thanks too to the Dept. of Public Works whose help behind the scenes is much appreciated.